you captured her (and the moment) perfectly. I can't get enough of your work.--I'll be checking back for more. That's wonderful! You should get a print made of it... it's too great just to post on your blog! Ward: This must be the most well-documented first day of school in the history of organized school. You and Andrea took stills and videos, you've both documented it on your blogs, and now you've drawn the event. I LOVE IT! Not like your old mom who only took one picture of you standing in the doorway with your jeans rolled up 'cause your little legs were too short for the length, carrying your lunchpail (do you remember what it was?) and a HUGE smile on your face. (tearing up). Great memory. I remember I had an "Adam 12" lunchbox at one point. Is that the one? Huzzah! Glad you submitted, Mr Jenkins. School sure starts early where you are. You sure are one dotin' dad. I'm very touched by this piece. I just now realized what your style reminds me of. Do you ever check out the daily comic "The Norm"? It's nicely done, a touch inspired by Bill Watterson (will anyone ever come close to that guy?). Nice concept, Ward. I like the kid at the end of the line. There but not really. I think it was Adam 12. Can't believe I bought that for you! Great piece you've done here! great stuff Mr. Jenkins - your colors, as usual, are brilliant. She looks so fresh and eager! What a perfectly lovely way to capture her big day :> Such pretty colors, too! what a lovely sight! and so sweet! 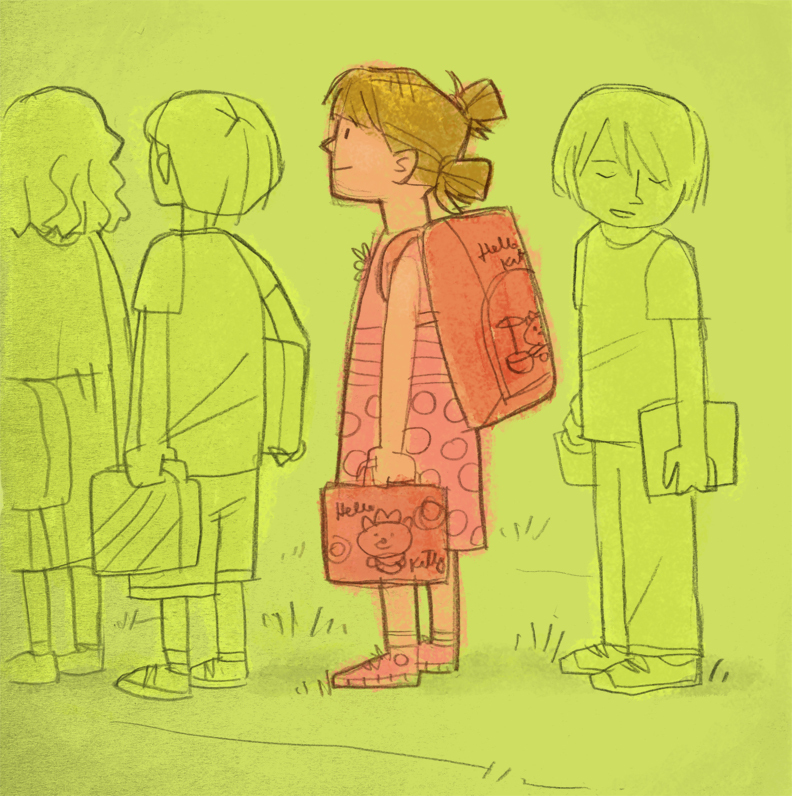 This is really a nice interpretation of Ava on her first day of school! I wonder how you draw the pic that fast right after that significant event? This is so great! I was just thinking the other day that I should start a sketchbook for each of my kids for big events and special moments. My Mom used to take pics of me and my brother in front of our house with our lunchboxes too! Hey Ward! Just wanted to say 'thanks' for spending some time the other day. I stopped by on your 5-year anniversary and enjoyed reading/reviewing about it on the blog. I thought to myself, "When Ward was considering this decision, he didn't even exist to me." I'm glad you exist. I can say with all honesty that I never saw it coming. I hope Ava has a great year at school. Mr. Ludwick, I, too, can honestly say that I'm glad that you exist. Thanks for the good talk, as it's never a dull moment when you and I get together. Can't say that Primal has been the same without you. You are sorely missed, brother! Ava looks like she's ready to conquer the world, in a nice way of course. I think it's the kid standing behind her that everyone is concerned about. He's the one whose mom is working all day,and has no relatives nearby to take him to the barbershop for her. His dad is serving in Iraq and money is tight. He has a little brother about two years old and his mom is expecting again. I only know this about him because when I went to pick my grandaughter up from kindergarten today his grandmother, who lives five hours away but was visiting for the week, was telling me the whole story. He came out in the line looking so much like your drawing it was eerie. hey ward! great entry for wisdom! very honest and true and tres cool! Aw. Makes me a little teary (with my own daughter starting pre-k) in a week. love this. was searching for a pic of kids in line for my classroom wall. gorgeous. nice work.